Cooking mussels is easy - with our tips! Wondering how to cook mussels? We have lots of delicious mussel recipes - as well as tips for cooking them perfectly. Steaming, grilling, and baking are most popular ways of cooking mussels, and we share lots of mussel recipes. But first, take a quick look at our 5 top cooking tips for how to cook mussels perfectly every time. Tip 1: Never overcook mussels! Cooking mussels just until they're done. Trust us, cook them too long and you'll have a tough, tasteless mess! How do you know when they're done? Easy - the shells open up. Once they open, they're done. When steaming mussels - the most common as well as the easiest mussel cooking method - choose your widest pot or kettle. This allows the cooking liquid and steam to reach the mussels easily. Since the mussels will probably be in more than 1 layer, shake the pot every minute or so to redistribute the layers. For cooking up to 2 pounds of mussels, we often use an 11 inch wide skillet with a glass top (you can see it in the above photo). The mussels have plenty of room, and we can see through the glass top so we know when they open . For cooking more than 2 pounds, we use an 11 inch wide soup pot. Or we use the skillet, and cook them in 2 or more batches. If you're grilling mussels, either scatter them across the surface of the grill or put them in a wide, shallow pan to place on top of the grill. Remove mussels from the heat as soon as their shells open. Since they usually open at different times, use a slotted spoon or bamboo tongs to carefully remove open mussels while others continue cooking. But wait . 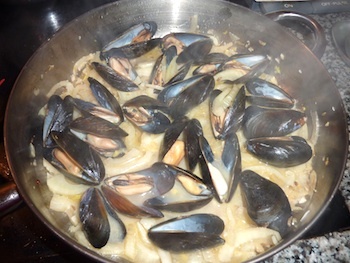 . . since you must put a lid on the pot in order to produce plenty of steam, how will you know when the mussels open? See Tip 4! If you're steaming the mussels, take the top off the pot after 3 minutes. See any open shells? If so, remove them and leave the pot top off while the others finish steaming, taking them out as they open. If none have opened yet, put the pot top back on and check again at 1-minute intervals until they start opening. We find that steaming mussels usually takes just 3-5 minutes. If you're grilling mussels, checking for doneness is even easier - just lift up the top of the grill. Again, 3 minutes is a good starting point. For baked mussel dishes, we always steam the mussels first. However, baking presents a different challenge: since the mussels are already cooked, how do you prevent overcooking since you're, um, basically recooking them? Here's the secret: make sure the recipe calls for baking them just a short time, like 5 minutes. That way, baking will heat them but not re-cook them. Any longer, and you risk a rubbery texture. If mussels don't open, they weren't alive before landing in your pot. Throw them out - and enjoy all the others!